During 2012, Google’s Nexus 4 was the smartphone in the market. It received all the latest updates in no time. But now, Google won’t provide any official update for its Nexus 4 device which is acceptable as the device is quite outdated now. But, things don’t end here. There’re developers out there who won’t give up on a device & device’s age won’t be a barrier. The legendary Nexus 4 is still holding up strong & ready for Android Nougat 7.0 ROM update. Android Nougat provides a lot of major improvements and refinements over Marshmallow, along with quite a few nice new usability changes. There’s way more exciting background stuff going on in Nougat than you see on the surface. Multi Window / Split screen mode. Step 2. Turn off / Switch off your Google Nexus 4. Step 3. Press and hold Press & hold Voldown + Power button, it will get you to the bootloader, then select recovery from there to boot into Recovery mode. Step 4. Do not forget to perform a nandroid backup. Goto backup option in TWRP and select all the partitions including System, Data, Boot, Recovery and swipe right to backup. Step 8. Next, Goto TWRP main menu & goto Install option. Locate the ROM file & tap on it. Now swipe to Install the ROM. Step 9. Once the installation process is finished successfully, Again Goto TWRP Main menu, Tap on Install & locate the GApps zip file. Swipe to install GApps Package. Step 10. From recovery select “reboot”. First boot might take 4-5mins, so don’t panic. Just skip them if shown. Also if Google Play Services is crashing, grant it the location permission in the settings. I’m also surprised to say that even with your data not wiped, it’s working. This ROM cannot be used as a daily driver because of its list of bugs & the ROM is still in development. 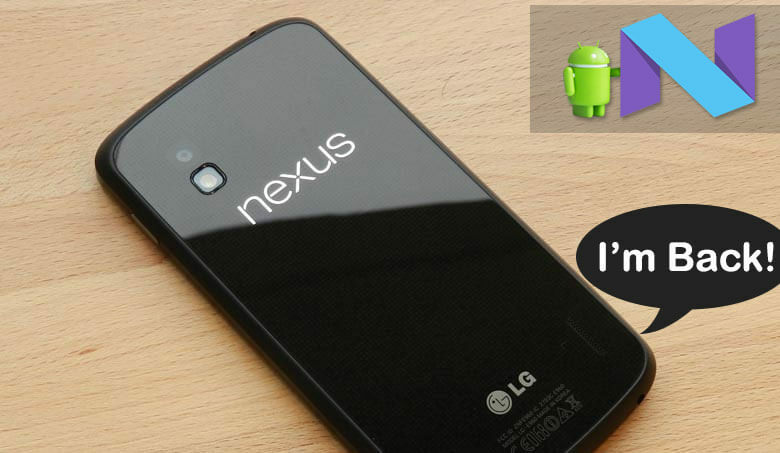 Try this ROM only if Nexus 4 is your secondary device.